Engineers and workers at SK E&C celebrate the completion of the Eurasia Undersea Tunnel in Istanbul on Aug. 22. 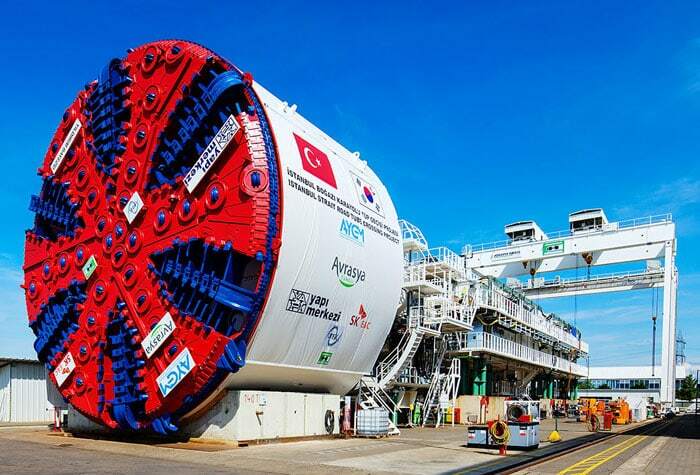 An underwater tunnel that connects Europe and Asia underneath the Bosphorus has now been linked up using the technology and engineering of a Korean construction firm. SK Engineering & Construction (SK E&C) held a ceremony on Aug. 22 to mark the completion of the Eurasia Undersea Tunnel. The celebration was attended by Turkish Prime Minister Ahmet Davutoglu and other government officials, as well as company staff and workers. This specific project underneath the Bosphorus consists of a two-story, 5.4-kilometer undersea tunnel that is part of the larger 14.6-kilometer Eurasia Undersea Tunnel. As the first-ever Korean firm to be part of such an underwater construction project, SK E&C received the order with Turkish firm Yapi Merkezi in 2008. In April last year, they began excavating with a special tunnel-boring machine (TBM). The Eurasia Undersea Tunnel runs under the Bosphorus. The tunnel-boring machine (TBM) is developed by SK E&C for the Eurasia Undersea Tunnel. It is as tall as a five-story apartment building. The company named the machine after Yildirim Bayezid (1360-1403), a sultan who sat on the throne during the glory days of the Ottoman Empire. SK E&C builds a two-story undersea tunnel using an auger that is 13.7 meters in diameter, 120-meters high and which weighs 330 tons. The above image shows an artist’s impression of the tunnel. Underwater tunnels require highly developed technology in order to bore a hole in the bedrock while enduring the water pressure, too. SK E&C developed a giant TBM that is 13.7 meters in diameter, 120 meters high, and which weighs 330 tons. By using such special equipment, the company went down as deep as 106 meters below the bottom of the straits to penetrate the bedrock, placing concrete structures on the inner walls of the tunnel in order to secure a space while enduring water pressure as high as 11 times that of sea level. Thanks to the TBM and its engineering, the company removed enough earth to fill 100 loads of 25-ton dump trucks and proceeded an average of 6.6 meters forward each day. This technology enabled the completion of the underwater section of the project within 16 months. SK E&C will finish the four-lane, two-story tunnel in March 2017. The Turkish government predicts that the tunnel will help improve traffic congestion in Istanbul, which has a population of roughly 14 million. Once the tunnel is complete and opened, about 120,000 cars can commute through the tunnel each day. It will remarkably shorten travel time across the Bosphorus, which currently takes around 100 minutes, reducing it to about 15 minutes. SK E&C builds an underwater tunnel, marked with green dots, under the Bosphorus, part of the longer Eurasia Undersea Tunnel. This section will connect Kazlıçeşme on the European side to Göztepe on the Asian side of the straits.